1. Combine coleslaw mix and onion in a large bowl. 2. Mix together miracle whip, oil, sugar, vinegar, salt and poppy seeds. 3. Pour dressing over cabbage mixture, toss well to coat. 4. Cover and chill at least 2 hours before serving. *Sometimes I will just put everything in a bowl together and mix it all at once. 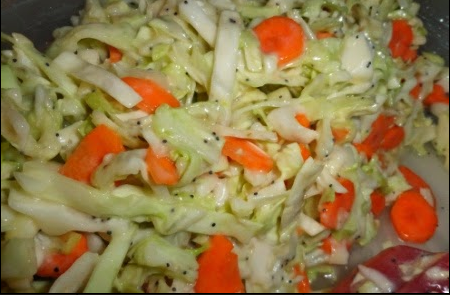 *Its also easy to mix the dressing ingredients in the large bowl then add the onion and coleslaw. *I don't always allow 2 hours for chilling and its still great!